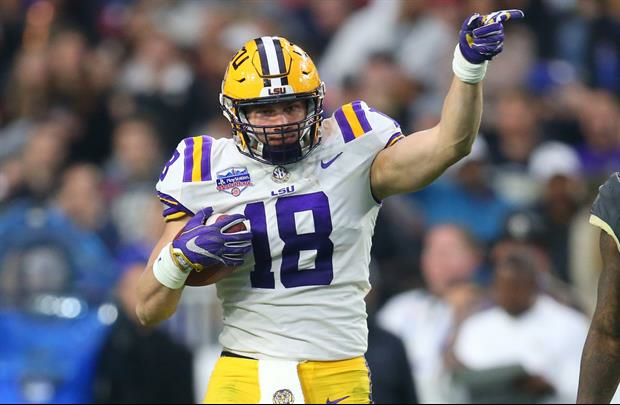 LSU’s list of NFL Combine invites include: safety John Battle, running back Nick Brossette, tight end Foster Moreau, kicker Cole Tracy, linebacker Devin White and cornerback Greedy Williams. The NFL Combine takes place starting on February 26 and runs through March 4 at the Lucas Oil Stadium in Indianapolis. The NFL Network will provide coverage of the on-field portion of the combine starting on March 1 when the running backs, offensive line, kickers and other special teams players have their workout. On March 2, quarterbacks, wide receivers and tight ends have their workouts, followed by the defensive line and linebackers on March 3 and the defensive backs on March 4. LSU is currently projected to have two first round draft picks in White and Williams, who are both listed as top 10 selections by most publications. All of LSU’s draft-eligible players will take part in Pro Day on the LSU campus on Friday, March 22. Six invited and all six should get drafted. I see Devin White having best bench of the whole combine this year. How many of them sat out the bowl game? Foster Moreau sadly was under utilized all year. I look for him to go earlier in the draft after this combine, he's a beast. Moreau will surprise a lot of people. The Cole Tracy story continues. Pretty damn cool. Alexander has knee issues already. That’s why he went early. I don’t blame him. Every year he plays they are getting worse. Wasn’t an option as far as staying for another and risk getting more injured. Yes. He wasn’t completely ready for NFL but his body can’t take any more abuse in college if he’s going to make it in the NFL. Thats when you take advantage of that free education. Anyone doubt how hard he is working right now to show out? Put on a clinic! Next. Dude is going to put up stupid numbers and make when more money. Book it.